John Gosden’s Group One exploits home and abroad with superstars such as Enable and Cracksman have been a high-profile theme throughout the summer. It was therefore a highly appropriate culmination in the Marathonbet-sponsored November Handicap, on the final day of the turf campaign, that Royal Line put behind him his eclipse as favourite 12 months ago. He scooted clear at 9-1 this time under Robert Havlin to beat Hughie Morrison’s 33-1 shot Not So Sleepy and Ian Williams’ Reshoun by one and a half lengths and a head. Birds Of Prey was a neck further back in fourth, ridden by Megan Nicholls for her father, Paul. Gosden, who had failed to add to his record-equalling fifth November Handicap success for the past six years, took the family tally to nine – adding to his father Towser’s three winners. He has also put himself one ahead of Sam Hall, whose five wins came in the days when the race was known as the Manchester November Handicap and run on the other side of the Pennines. 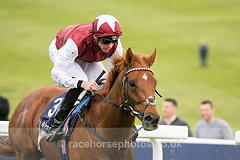 From the moment Havlin and Royal Line headed Birds Of Prey two furlongs out, it was clear the four-year-old was a class apart in this traditionally ultra-competitive mile-and-a-half event. In Gosden’s absence, Havlin was happy to pay tribute to the master trainer’s skills. Royal Line had run only twice since finishing seventh at his first attempt in this race. “He was rated 96, but he was a three-year-old and this race doesn’t have good stats for three-year-olds,” added Havlin. “We did fancy him (then), but he was a lot busier last year. “He’s won it off 105 today, and I hope we can keep him for next year. Havlin had plenty in hand, even though Royal Line was giving up to a stone to all but two of his rivals. “He’s won his last few gallops at home, so we came here hopeful,” he said. “I didn’t really have a plan. I thought if he jumps slow, I’ll slot in. “I had to keep letting him go forward, and eventually found a spot one off the fence. “But then I felt as if I got there a mile too soon – because when they opened up at the three (furlong pole), he just took me in there. The November Handicap was originally held at the New Barns, Manchester, where it was called the Manchester November Handicap. It was established in 1876, and was initially run over 1 mile and 4 furlongs before contested over 1 mile and 6 furlongs in 1880. It was cut to its present length in 1902 when the race was re-located to the Castle Irwell course. The race was staged at Pontefract from 1942 to 1945. It returned to Manchester in 1946, and continued there until the venue closed in 1963. The event was transferred to Doncaster in 1964, and from this point it was known as the Manchester Handicap. For a period it took place in October, on the same day as the Observer Gold Cup. It was rescheduled for November and given its current title in 1976. The November Handicap is now run on the last day of Britain's turf flat racing season.